Ian had been waiting for some pike fishing and we made arrangements to fish for them. The weather looked none too promising cloudless sky, 18c and little wind. It would have made for a beautiful September day. But this was mid November and we still have not had a good frost. The river has not been in flood since last winter, and more importantly we have had hardly any rain since the winter. I ve never seen the river so low since I’ve been fishing it in the early 70’s. I guess one of the only good points about this is that perhaps the fry survival rate for the year might be higher than the norm. There has been a surprising amount of weed growth and one that has done particularly well has been something call azolla which is a water fern. This has blocked the river surface in places where there is insufficient flow. 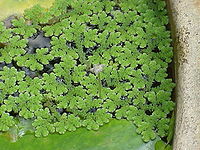 It is the same family as duck weed of which there is plenty of that too. One good flush through of flood water should see the river refreshed and clear of most of the debris built up over the last 9 months. Anyhow back to the fishing. We decided to fish the top end part of the river, the river was still low and clear at this point. We were using a sink and draw method with smelts being the bait. I saw one small pike almost take the bait but decided it wasn’t quite right. Ian’s presentation of the bait was pretty good but was improving as the day passed. By 11am we hadn’t had much interest in the swims we fished. I think the clarity and the amount of weed in the river made it more difficult. We went about 1 mile further downstream where we found the river with a little more colour and flow. This difference was probably made from a small stream that enters the river. Any rain and it does colour up and discolours the main river. The first swim we fished we had a pike just under 20, well we could leave it there but I would have to say 20″ and not pounds. Almost the next cast Ian and I saw another pike come up and smash into the bait. Ian left it for a few seconds and then struck into another one which was slightly bigger at 6lbs 2oz. We walked further downstream but couldn’t get another take. 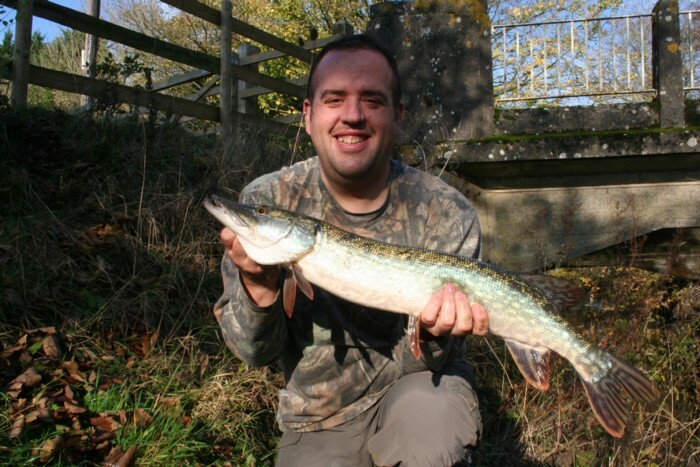 We bumped into another angler who had caught a small pike all morning. At midday we decided to head off to another stretch. 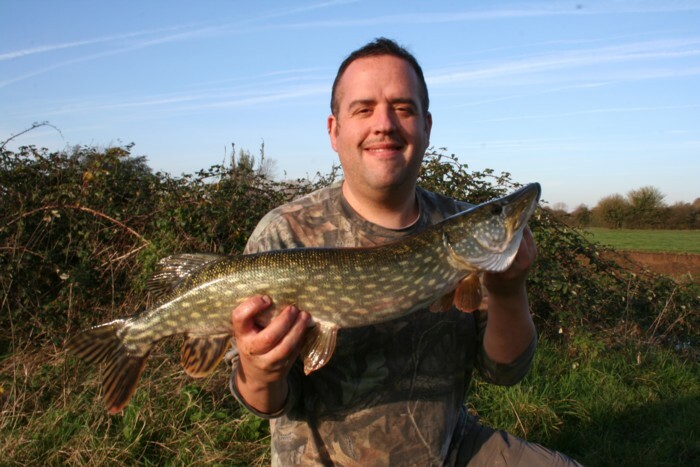 The river here is wider and does hold some good food fish for the pike. The river was still a little coloured but without much flow. We tried a few swims and then came to my banker swim. Ian cast out a couple of times and as he was retrieving the bait a small fish jumped out from the water obviously being chased. He stopped retrieving and his float got pulled under by the culprit. Soon the hooks were set and the fight was on. It wasn’t a huge fish but still pulled back a bit. Soon though it was in the net. So one just a little larger, but not what we were after. You can see the clear blue sky and Ian in a T shirt. Ian’s ask me to point out his upper lip hair (can’t call it a moustache buddy) is grown in aid of prostate cancer charity which takes place in November. Good on you Ian. We tried a few other swims and then spot a few fish jumping out of the water fleeing a predator. Eventually we arrive at the spot of the fleeing fish and sure enough after a couple of casts Ian hooks another pike which again isn’t that large. But as he brings it close to the bank the hooks fall out and off it swims. It goes to show that if you keep your eyes open then opportunities come along. For the last hour we decided to fish static baits under the float to see what come along. Anyone who has been sinking and drawing dead baits for 8hrs will know it really hurts your back and Ian was feeling it. So we settled into another swim and we had one small enquiry from something that had the float bobbing around a little but no run materialised from it. Often it can be perch investigating but on feeling the resistance of the weight lets go. Nothing much happened as the sun sank below the horizon. However on making our way back to the car be bumped into Dr. Mark Everard fishing. As we were talking I saw a nice roach roll in the swim……could they be about to feed. I told Mark I was off to fish for grayling on the Itchen on Tuesday, he was down that way too but on the river Test we wished each other the best of luck and said our goodbyes. Ian enjoyed his day and I could see that his skills improved throughout the day. Realistically I don’t think we could have done much more with the weather and the river conditions. I suppose we could have fished the much deeper stretches of the river however it’s good for people to see the takes from the fish. Now I’m really looking forward to fish the Itchen and catching a few of those lovely ladies of the river. I’m fishing with Alan, Colin and Tony and as we all live a fair distance away from the river it’s a very early start for us in the morning. This entry was posted on Monday, November 14th, 2011 at 10:12 pm	and is filed under Uncategorized. You can follow any responses to this entry through the RSS 2.0 feed. Both comments and pings are currently closed.